Amazon’s Kindle bookstore now offers more than 630,000 books, Amazon says, plus 1.8 million free, out-of-copyright titles. The overall e-book market is still a 90-pound weakling next to the Asiatic elephant of print publishing. According to a report from Publisher’s Weekly last year, hardback sales were projected to be about $4.4 billion in 2009 (including both adult and children’s titles), while paperbacks were expected to generate $5.1 billion in revenue, audiobooks $218 million, and e-books just $81 million — less than 1 percent of the print equivalents. That’s not even counting textbooks, Bibles and professional books — with those included, Publisher’s Weekly estimated the overall book market at $35 billion in 2009. Amazon also stated that sales of its Kindle e-book reader have tripled since it cut the price from $260 to $190, although Amazon did not provide any hard numbers about the number it had sold. The Kindle has topped Amazon’s list of bestselling products almost since it was first released two years ago. Readers don’t need a Kindle to read Kindle books, however. 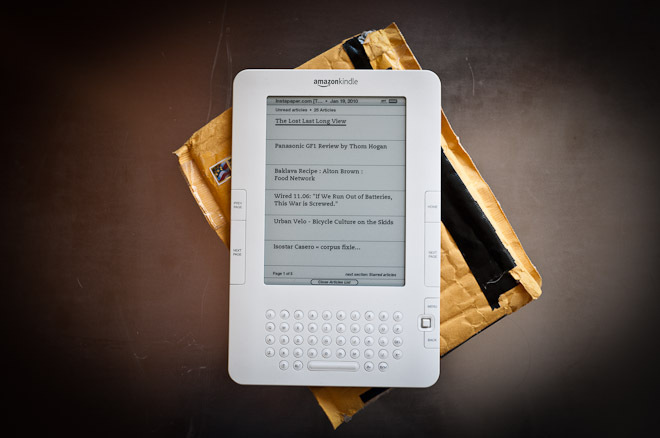 Amazon also offers Kindle e-book readers for the iPhone, iPad, BlackBerry, Android phones, and for Mac and Windows PCs. That kind of cross-platform reach is no doubt helping to increase the customer base for Amazon’s e-books, but it also serves as a reassuring security blanket: Even if you break your Kindle or lose it, you’ll still be able to read the books you’ve bought. While Amazon doesn’t provide a breakdown of sales by platform, we’re guessing that the vast majority come via the Kindle device, which, with its free 3G wireless connection and dead-simple e-bookstore, makes purchasing books about as effortless as can be. Amazon’s e-book crusade is also helped by the fact that hardcover books cost $26 on average, while Kindle books are far less. More than 510,000 of the titles in Amazon’s e-book catalog cost $10 or less, according to the company. With a discount like that, it’d take just about 11 e-books to justify the cost of a $180 Kindle, assuming you would have bought all of the hardcover alternatives at full price. And since e-books cost Amazon virtually nothing to distribute, the company — and the publishers whose books it is selling — should be enjoying pretty fat margins on these titles too. No wonder Amazon CEO Jeff Bezos always looks so happy.